While using Google Earth to do a flyover of several places in southeastern Arizona, I came across a view of what looked like a bomb range target on the Willcox Playa. Online research showed that the Playa had indeed once been a military range. And since I had never been out onto the dry lake, a trip to check out the target circles was a good reason to head down that way. A friend who also had never been into the area drove along in his truck. 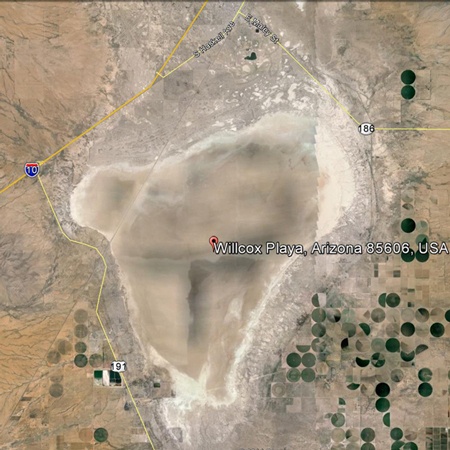 The Willcox Playa, is just south of the town of Willcox, and is Arizona's largest dry lake feature. It is triangular in shape with a width of approximately 8 miles and a length of nearly 10 miles. Today, the area is perhaps best known as a winter roosting area for thousands of sandhill cranes. 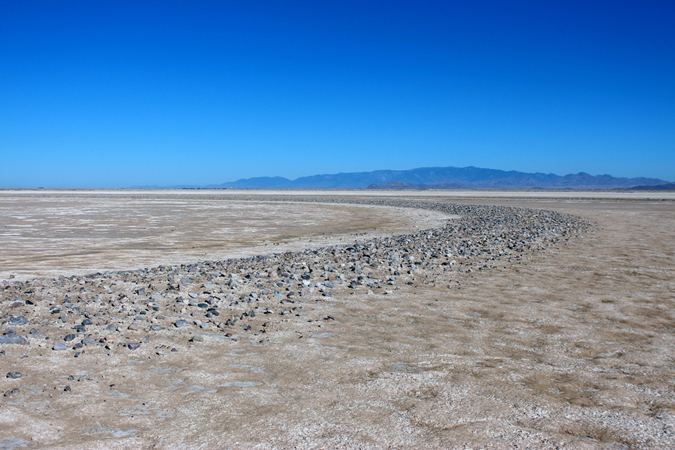 The playa is on the list of National Natural Landmarks. The target circles are in the northeastern corner of the playa, a few miles south of Highway 186. Google Earth seemed to show an access route down from that road towards the site. I am not sure what the land status of the area is, but when we arrived at the road that we were looking for, the gate through the right of way fence was not locked and there were no signs to indicate that entry was not permissible. The only notices indicated that sandhill crane hunting was not allowed south of the highway. 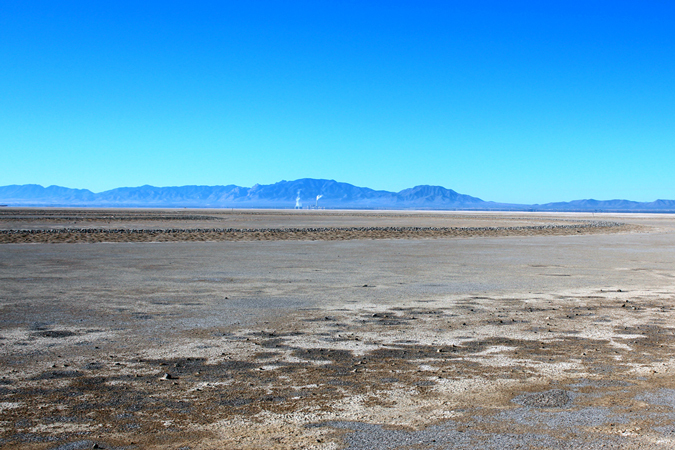 The terrain at the very northern end of the dry lake is not very playa like. The area was very sandy and there were quite a few low dunes. I have since read that this side of the lake is the downwind side where the material blown across the playa ends up. The route was more of a two track trail than a road. The playa is visible from Interstate 10. On our drive down, we had noticed the reflection of sunlight off of standing water out on the "dry" lake. I was pretty skittish about driving into the area. I wondered if the surface could look dry, but the ground be pretty soft and mushy underneath. I soon found the answer to that question. The trail that we were on passed near a windmill and a metal tank. As I passed the tank, I sank into the ground pretty deeply. With some effort in 4WD, I was finally able to back out. It seems that the tank had been overflowing to the side that I was on. That overflow had caused the soft spot that I had not noticed.....Needless to say, I was pretty skittish after that and was pretty watchful of the terrain ahead. A half mile or south of the highway, we parked our vehicles and set off to find the target circles on foot. It was a hike of a little more than 2 miles to the site. As we walked south, there was an interesting transition in the vegetation and terrain. The grasses all but disappeared. In place of the grasses were widely spaced bushes whose roots were trapping the sediment in low hummocks. And then there was nothing growing at all! The "soil" was white and mostly clay and silt. 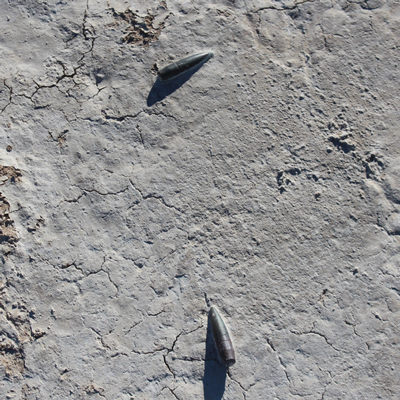 It was not long before 50 caliber bullets started to appear on the playa surface. As we got closer to the target circles, they became more numerous. There were a few 50 cal casings. The chemicals of the playa have not been kind to those relics. The rings of the old target are not really visible until you are quite close. I have been to several other sites similar to this. 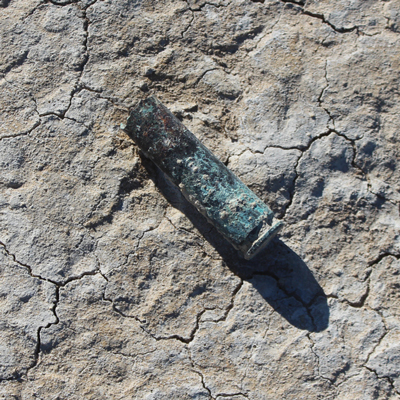 At those locations, there were many remnants of the old practice ammunition and many bomb fragments. As far as bomb materials, there were none seen at this site. The Willcox Air Force Range was acquired in 1943 for use by Davis-Monthan Field for bombing and air to ground gunnery training. Improvements on the range consisted of the construction of buildings, an above ground steel tank, aiming circles, and air to ground targets. Historical documents indicate that remote controlled trucks were also used as bombing targets. 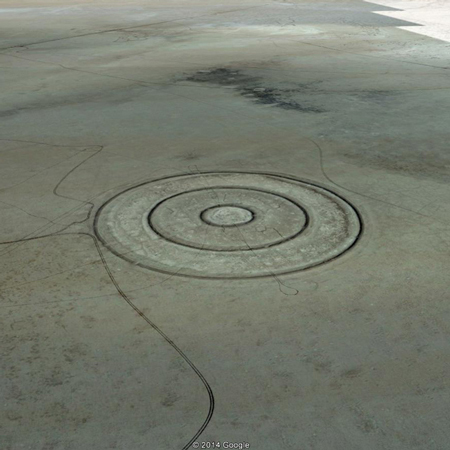 In the area of the target circles, nothing remains of any other structures. 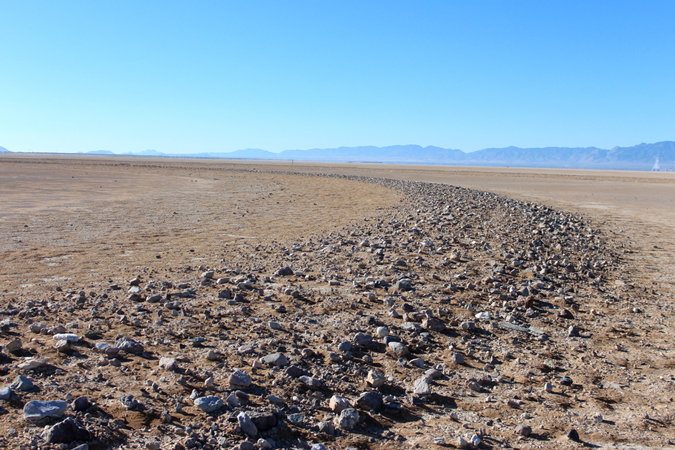 The website referenced above mentions that a large portion of the playa is still maintained as an electronic testing ground for Fort Huachuca. We saw no evidence of that kind of activity in this northern area. Once out onto the playa, we found the driving to be very easy, so we hatched the idea to drive onward across the "dry" lake. I wasn't up for just heading south but thought that we should hug the edges. Still pretty skittish after having gotten stuck earlier, I wasn't feeling real adventuresome. Using an old fence line as a guide, we drove several miles to the west toward the railroad tracks in the distance. At one point, we noticed that our tracks were getting deeper and the trucks were pulling a bit harder. We stopped to see what was going on and found that the ground disturbed by our passing was wet underneath. That was enough for me and I made the executive decision that we had ventured far enough. The return back the way we had come was uneventful and so concluded our trip down to the Willcox Playa and the old target circles.